Ireland 36th State to ratify Kampala Amendments: On 27 September 2018, Ireland deposited its instrument of ratification of the Kampala amendments, becoming the 36th State to ratify the amendments. ICC Assembly of States Parties (ASP) decides to activate the Court’s jurisdiction over the crime of aggression: In the early morning hours of 15 December, the 123 States Parties to the Rome Statute made the historic decision to enable the ICC to prosecute the crime of aggression. 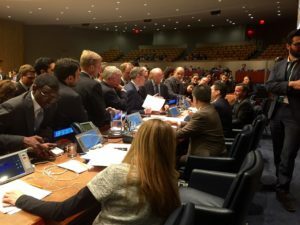 This marks the first time that humanity has had a permanent international court with the authority to hold individuals accountable for their decisions to commit aggression – the worst form of the illegal use of force. The ICC will be able to exercise its jurisdiction over the crime of aggression as of 17 July 2018, which also marks the 20th anniversary of the Rome Statute. The Court’s jurisdiction will be determined by the Kampala amendments on the crime of aggression, which were adopted in 2010 under the ASP presi dency of Liechtenstein’s UN Ambassador, Christian Wenaweser. Following the activation decision on 15 December, Ambassador Wenaweser recalled that “the Court’s jurisdiction is determined by the Rome Statute and States Parties are not only committed to the independence of the Court, but have an obligation not to infringe upon its mandate. We have expressed repeatedly our view that the Court’s jurisdiction relating to the crime of aggression is founded in articles 15 bis and 15 ter, which were adopted by consensus in Kampala. Article 15 bis paragraph 4 in particular is itself based on article 12 of the Rome Statute in which is enshrined the cardinal principle of the Court’s territorial jurisdiction.” The historic decision to activate the ICC’s jurisdiction over the crime of aggression not only completes the Rome Statute as originally drafted, but also reinforces the Charter of the United Nations and will help to deter aggressive war-making in the future. Panama 35th State to ratify Kampala Amendments: On 6 December 2017, Panama deposited its instrument of ratification of the Kampala amendments, becoming the 35th State to ratify the amendments. Argentina 34th State to ratify Kampala Amendments: On 28 April 2017, Argentina deposited its instrument of ratification of the Kampala amendments, becoming the 34th State to ratify the amendments. Chile ratifies Kampala Amendments: On 23 September 2016, Chile deposited its instrument of ratification of the Kampala Amendments during the UN Treaty Event, which was held on the margins of this year’s UN General Debate. Chile thus became the 32nd country to ratify the Kampala Amendments, and the 5th country from the Latin American and Caribbean region to do so.